Soundcloud is an online service allowing musicians, artists, DJs to upload music they have created and share with friends on poplar social networks. 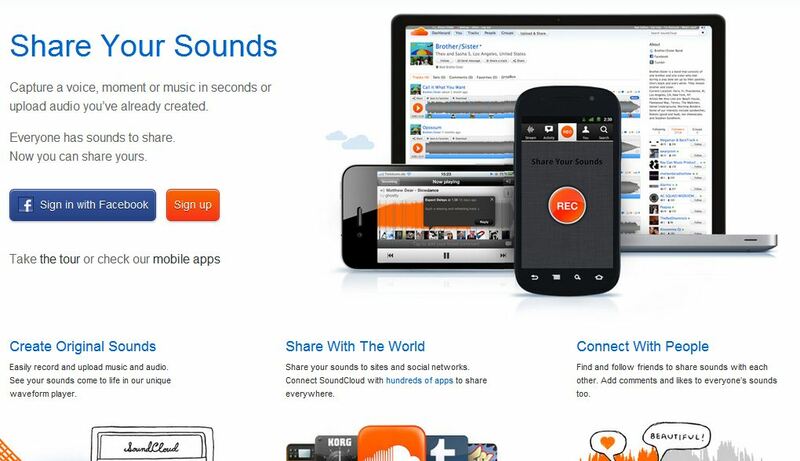 It also allows music lovers to listen to, discover and share new music, again with their friends via social networks. The first step requires users to hand over their email address or to signup via facebook. Some users find handing over personal details prior to using the service a major privacy issue, so including it as the first step may put off some potential customers, especially as their is no message reassuring the user that they will not share this information with third parties. 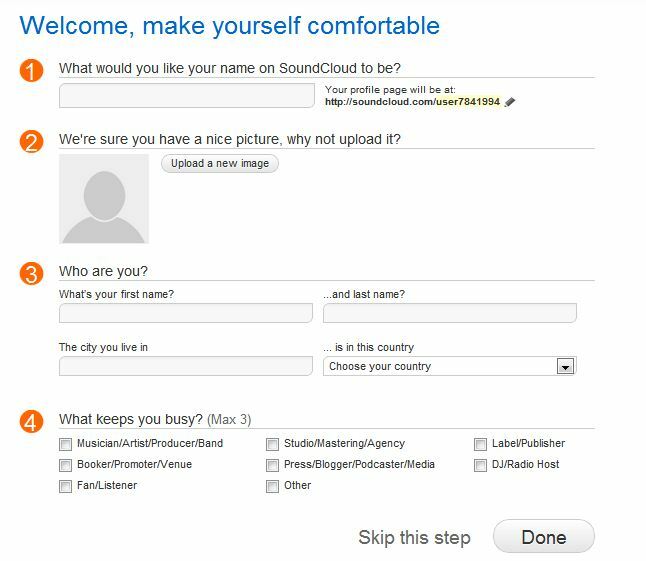 Soundcloud could have asked for this information once the user has filled out their profile information in step 2, or after they have started using the service and is further down the path of commitment to using soundcloud, this could help improve conversions. Soundcloud uses nice, conversational language to ask for information about the user. The headline of the page is “Welcome, make yourself comfortable”. Instead of just asking for a “Profile Picture”, the form label is “We’re sure you have a nice picture, why not upload it”. This conversational tone, although making the form labels harder to scan as the user has to process more words, helps personalise the service and and should encourage users to fill out their information in more detail. The last question is important, “What keeps you busy” as this is an important data capture question that will help soundcloud to further personalise the service, content and marketing messages once the user has completed the sign up process. The Primary action of “Done” is distinguished nicely by size, although research shows that for ease and speed of form completion these should left aligned, with the primary action on the far left of the page. Soundcloud uses a visual data capture technique, much like Pinterest, to try and help them personalise the service and display relevant content once the user has completed the sign up process. They display images and names of popular artists, which a user just needs to click on. However, Soundcloud display so many, and then continue to reveal more artists as you scroll down that it is quite overwhelming for a user to try to see and pick the musicians that are relevant to them. I actually only selected one as I found it hard to see musicians I liked. Unless they have found this data capture method to be successful, they would likely be better served by chunking these questions into sections. For example, an initial step which asks users to select the types of genres, or a list of 20 popular artists from a broad spectrum of musicians that they like. In a second step providing a refined list of artists and recommendations based on the answers in step 1. This would allow them to collect more data and display more relevant content within the dashboard to enable discovery and use of the service. 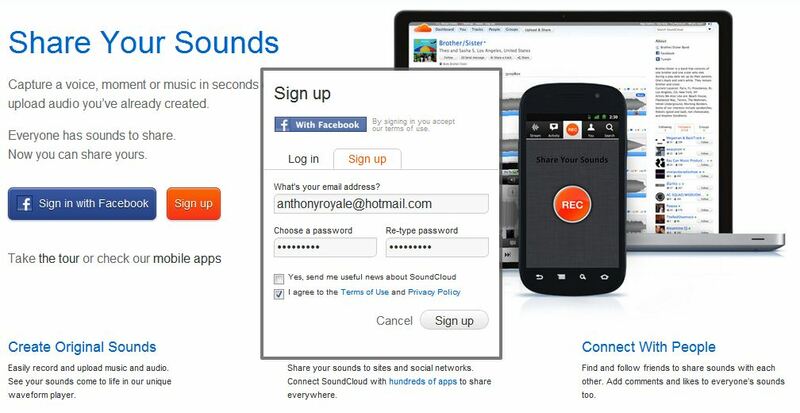 The Soundcloud sign up is relatively simple, although requesting an email address as the first step and providing an overwhelming number of artists to choose from may affect the sign up form abandonment rate and the amount of data they collect. The conversational tone used in the form labels is nice and well implemented.